As the snowbirds arrived in Florida along with the mild January breezes, a small uprising of laborers who work under lock and key stopped production and made demands. This coordinated struggle was carried out by members of one of the most violently exploited groups in America: incarcerated workers. Inmates at 17 Florida prisons launched the labor strike, calling themselves “Operation PUSH”, to demand higher wages and the reintroduction of parole incentives for specific groups of inmates. The striking prisoners argued that because they receive little to no pay for their labor, they are nothing more than modern-day slaves under the 13th Amendment, which prohibits slavery and indentured servitude except as punishment for the conviction of a crime. By refusing to cook, clean, and generally maintain the prison facilities, the incarcerated workers aimed to put aside their differences and work together, to leverage their labor against corrections officials until they caved in to their demands. “This is our chance to establish UNITY and SOLIDARITY,” prisoner organizers proclaimed. Operation PUSH is just the latest action in a growing movement to organize inmates and for some, to abolish the prison system altogether. In order to maintain the pressure, incarcerated workers and allies have already called for more direct actions on June 19th, the annual holiday to commemorate the abolition of slavery and more commonly referred to as Juneteenth. Prisoners and allies have also announced another wave of strike actions set to begin later this summer on August 21. Prisoners who choose to take part in collective action do so at great risk to themselves and others. In the wake of the Florida strike, reports trickled out about how corrections officials meted out a range of disciplinary actions against the striking inmates, including placing them in solitary confinement, restricting their communication, and transferring them to facilities further away from their loved ones. Today’s inmate organizing has a powerful precedent. During the early 1970s, the prisoners’ union movement counted tens of thousands of members in prisons from California to North Carolina. This activism was inspired by Black Power organizing as well as decades of agitation by both Black and white prisoners to expand their legal rights. But there was one Southern inmate union in particular, in the least unionized state in the country, that forced legal battles about whether prisoners have the right to free speech and assembly. At its height in the early 1970s, the North Carolina Prisoners’ Labor Union collected union cards from more than 5,000 prisoners, roughly half of the state’s total inmate population. The union’s board of directors stressed interracial solidarity and organized across racial lines, with Blacks, Lumbee Indians, and whites working together to demand change. Their calls for collective bargaining rights, higher wages, and a larger voice in the grievance process pitted union members against corrections officials in a legal showdown for institutional control. 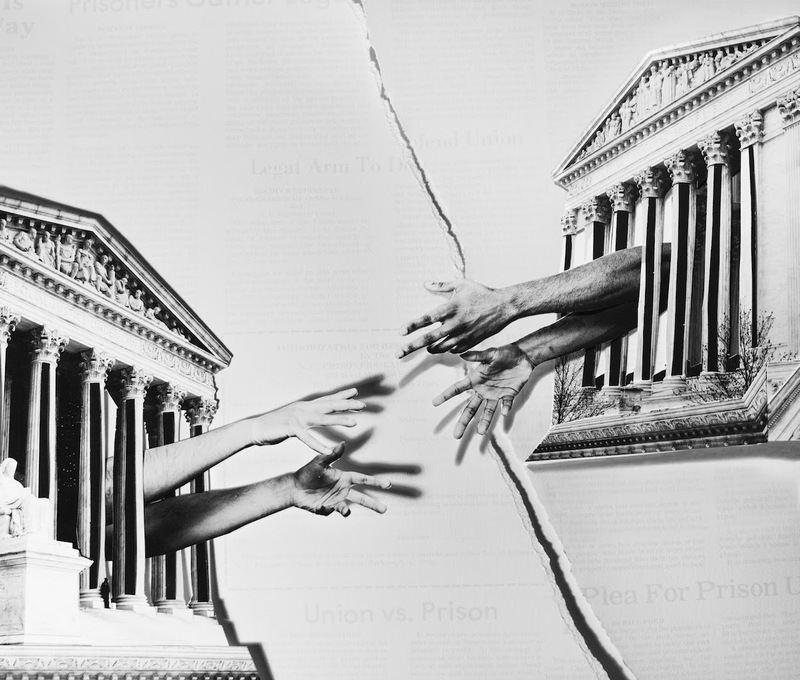 The struggle to expand prisoners’ rights to free speech and assembly received a heavy blow with the 1977 Supreme Court ruling in Jones v. The North Carolina Prisoners’ Labor Union. While not explicitly banning labor unions in prisons, the Jones decision made it nearly impossible for prisoners to collectively organize behind bars. Even more deleterious, advocates say, was the Supreme Court’s institution of a “hands-off” doctrine when it comes to determining whether inmates’ First Amendment rights should be overruled in cases where the institutional safety of prisons is concerned, effectively ceding decision-making power back into the hands of prison administrators. Although the North Carolina Prisoners’ Labor Union was defeated by the U.S. Supreme Court decision more than 40 years ago, these interviews describe a time in North Carolina when prisoners found hope in solidarity. As the next national prison strike approaches, they may do so again. “Supreme Court justices tend to defer to corrections officials in prisoners’ rights cases,” said Amanda Hughett, a fellow at SUNY-Buffalo’s Baldy Center for Law & Social Policy who is currently writing a book about the North Carolina Prisoners’ Labor Union. The Jones decision all but ensured the demise of the North Carolina Prisoners’ Labor Union and for awhile, it seemed that this history was lost. However, during the last decade, largely as a result of growing awareness about mass incarceration, and political organizing that identifies with prison abolition, there has been renewed scholarly interest in prisoner activism. Over the course of several months, Jonathan Michels spoke to three North Carolina veterans of the prisoners’ union struggle. NCPLU organizers Robbie Purner and Chuck Eppinette worked diligently from the outside to support incarcerated worker resistance. Meanwhile, prisoner Jim Grant organized on the cell block. All three were irrevocably marked by the experience. After receiving his PhD in organic chemistry from Pennsylvania State University, Jim Grant traveled south for a short stint with Volunteers In Service to America, or VISTA, the domestic version of the Peace Corps, working mainly in communities of color. Grant continued to strengthen his ties with social justice organizations as a correspondent for African-American publications like The Southern Patriot. Later, he and two other African-American men garnered national attention when they were accused of setting fire to a riding stable near Charlotte. Although he consistently maintained his innocence, Grant received a 25-year sentence for the deadly blaze. The case of the “Charlotte Three” became a cause célèbre among some of the most prominent social justice activists of the day, including Angela Davis and James Baldwin, and for the first time in the organization’s history, Amnesty International designated the self-effacing Grant and his friends political prisoners. While protesters marched in the streets for Grant’s release, he continued to agitate for change on the cell block as a union organizer with the North Carolina Prisoners’ Labor Union. The following is an edited transcript of my interview with Grant in January 2018. In 1975, I got involved in the prisoners' labor union after I was sent from the Atlanta Federal Penitentiary. My feeling was that you try and organize wherever you happen to be. I met Wayne [Brooks] and Donald Morgan but I didn't know them originally. I came in late. They had already started the prisoners' labor union when I got here from Atlanta. Don was the one who was always in his books. Wayne not so much. Wayne was more into talking with the prisoners like I was. There were a lot of different things that needed to be dealt with by the Department of Corrections that weren't being dealt with. We weren't talking about immediate parole or anything of that nature. We were talking about everyday issues. We felt that we should be the ones to make decisions about those types of things. One of the issues up there at the camp in Newland was related to the fact that there were no guards who were either [Indigenous] or Black. It was an all-white guard force. There were 35 Black [prisoners] and three Native Americans who were there at the camp in Newland. Everybody else was white. There was no one up there that we could speak with. We said that we wanted somebody that we could talk to who was familiar with us and familiar with our way of living. They had people working in the fields. Why not pay them so they can take care of their families? Everyone was saying these folks are on welfare. Okay, well get them off of welfare. Put them to work. We'd be glad to work. But pay them a decent wage. A lot of the guys in prison, a lot of them don't know how to read. We tried to help those who couldn't read and who wanted help with contacting their family. We had a couple of sit-ins in the different camps about food. The food was not fit and it needed to be improved. That came to pass. Some of the guys didn't want to get involved with it because they said that would hurt their parole chances. They sent some of them to the hole for joining. At least that's what we think the reason was. Some of them didn't give a damn. They went ahead and joined anyway. It was worth it to me. I didn't give a damn too much about parole issues or anything of that nature. But I'm only one person. I'm not going to be able to move around and take this issue into my hands and run with it. I'm more of a teacher type of person. I'll teach you and try and see that you know enough to take things on. It gives the other person the fact that they have to carry the ball. It makes them more willing to step out if they're given the ball to carry. It wasn't easy to contact other union members. If you wanted to contact Donald Morgan, you wouldn't know where the hell to find him. We worked through Robbie and Chuck. They were the ones who were able to maintain some level of coherency between the members. We were scattered all over the place. You never know where the hell they are. They were the only ones that would let us know. They would keep things rolling. And any of the legal stuff was totally in their hands. I still think that the union should have happened. I don't see people coming to the same conclusion like they did in 1975 but I think that people are not going to continue to put up with prisons as they are now. The fact that you were able to at least get somebody to even think of making a move like that has to be looked at with some level of hope. I'm more of a teacher type of person. I'll teach you and try and see that you know enough to take things on. I can't do damn near as much as I used to be able to. But the younger ones need to really understand that if they continue to push forward, they might be able to get something done. One thing we need to understand is just because people end up going to prison for one reason or another doesn't mean you need to give up your right to be able to speak out and stand up for what you believe in. Your everyday issues. That you don't give up those things. I think a lot of those folks probably shouldn't even be in prison. What they have to say both in the way in which they look at the conditions inside as well as the whole issue of prison as a way of keeping people in their place. Maybe that's not the way to do it. In this three-part series we share excerpts from interviews Jonathan Michels conducted with members of the North Carolina Prisoners' Labor Union, an often overlooked part of Southern labor history. This week we hear from Robbie Purner. In this three-part series we share excerpts from interviews Jonathan Michels conducted with members of the North Carolina Prisoners' Labor Union, an often overlooked part of Southern labor history. This week we hear from Chuck Eppinette. They don’t have a union and it’s illegal for them to strike. So these workers are using direct action to get what they need.